Sarah Wolsey Dip FD and her brother Daniel. Sarah never expected to be called to funeral directing but, when her brother and his wife lost their daughter, Millie, she began attending their bereavement counselling group and, through talking to other bereaved families, found that she was able to connect with them. She then sought out voluntary work in the funeral industry and went on to train to be a funeral director with an excellent independent business in the Black Country. She is currently training to be a bereavement support counsellor for a local hospice. Sarah says, “I give Winston’s Wish books to bereaved children. We pay for the publishing of Bereavement Guides for bereaved children and offer them free to whoever needs them, our local hospices, local schools, local hospitals.” Both Sarah and Daniel confess to being workaholics, but when they can tear themselves away from the funeral home, Daniel enjoys ice hockey and Sarah enjoys long walks, socialising, badminton and swimming – and a bit of girlie shopping. Most people in this area want a formal funeral. Sarah and Daniel are able to meet their expectations in this: they pride themselves on their immaculate turnout and, it has to be said, they have a strong sense of ceremonial style – you rarely see it done as well as they do it here. They are also willing to tone down, if you want, and they will discuss this with you. They say, “Anyone can do whatever they want to do.” They have had family members and children walking in front of the funeral procession (in front of the hearse). It is a rare funeral director who will offer this option, and it is testimony to Daniel and Sarah’s genuineness and sincerity. When they talk about customer choice they really do mean it. Very smart fleet of vehicles plus less showy alternatives. They will discuss this with you. If it’s an estate car you’d prefer, that’s fine. They once took someone on their final journey in a sheep trailer. Sarah expresses herself with passion when she talks about what’s important to her. “We do this because we know no-one could take more care of a bereaved family, nor could anyone treat the deceased person with any more care or respect than we do.” It’s true, too. The philosophy here is to give everyone as good a funeral as Daniel and Sarah would arrange for a member of their own family. Very good value for money, and you only pay for what you want. In their own words, “We stick to a very simple and basic pricing structure which allows the family to decide how much they want us to do/ how much they want to do”. Sarah adds, “I want to offer our families the very best services, excellent facilities, unrivalled care and personal attention at a competitive price. I want our services to be affordable to those with a tight budget.” In our view, Daniel and Sarah aren’t just very good, they are exceptional – and well worth going out of your way for. You rarely see the standard set as high as this. A truly exceptional Funeral Directors. My husband and I had decided on Direct Cremation and, although this is not quite usual, Daniel and Sarah were prepared to arrange this for us in the best possible way. They made a devastating occurrence more bearable by the care they gave us. Also the guidance through practical matters other than funeral arrangements which have to be attended to at a time when you can’t think clearly was excellent, even going as far as arranging an appointment with the registrar for me. Following the loss of my mother in law Margaret i recommended that we contact Daniel Ross funerals. Prior to this a colleague at work told me about the exceptional service she had recieved when she lost her dad. From start to finish Sarah and Daniel were absolutely fantastic their service was so professional, caring and they are truley lovely people. They made Margarets send off so perfect we cannot recommend Sarah and Daniel enough. Your service was absolutely exceptional through and through. Thank you so much for looking after Margaret in the very kind and respectful way that you did. My husband passed away on 25th October 2015 and Sarah and Daniel made the loss easier. They were professional but caring to me, my daughter, son, grandchildren and family. They made me feel that Rod was important in death as in life. We cannot thank them enough for the way they looked after him and the family. I highly recommend them to anyone suffering a loss. I attended a funeral a few months’ ago and was impressed by the professionalism of this company. Unfortunately, I needed a funeral director sooner than anticipated for my father and their name came to mind. The funeral was held today and we were all so impressed and grateful for the way they handled absolutely everything from the first time we met Daniel and Sarah to the end of the service. I cannot recommend them highly enough. Sarah and Daniel were highly recommended to us by others who had used them when my Mum died and I’m so glad we took that advice. From start to finish, they handled the process professionally and with expert care and attention to detail. But they were more than professional and highly skilled; nothing was too much trouble, we were never hurried and their warmth and compassion shone through every time we had contact with them. They dealt effortlessly with various members of the family and supported my father particularly well. I also appreciated the very straightforward way they handled the financial side, giving us a clear quotation with a full breakdown of costs and explaining options that were then clearly reflected in the final bill. I can’t imagine we could have found better value and service anywhere else hence making the effort to post this glowing review (not something I normally make time to do) as they deserve it and is the best way I can think of to thank them. We recently lost our Aunt at the age of 89. We wanted a Funeral Director who would mirror the gentle care, respect and compassion we had given our Aunt whilst she laid at rest. We absolutely made the right decision to pass our Aunt into Sarah’s & Daniels care. They willing accommodated specific requests, such as holding a service at their chapel of rest the night before interment. They are undeniably two of the nicest people you could hope to meet at this sad time. Their sincerity, friendliness & professionalism were exemplary. Thank you both. Sarah and Daniel are truly lovely people. At the most painful time of my life they guided me through all of the necessary arrangements and together we created a very special day for my partner Steve. A day that myself, our family and our friends will never forget. I would absolutely and highly recommend Daniel Ross Funerals. The service we received from Daniel and Sarah was exceptional. They made something so difficult seem so effortless and as a family we felt, so cared for and my dad was treated with such respect and love. Nothing was too much trouble and as a family we would highly recommend Daniel Ross Funerals. Daniel Ross are a fantastic Funeral Directors, caring and professional in every way, highly recommended and truly lovely people. It is a difficult decision to choose a funeral director that will honour a loved one and give them the same dedication of care they had in life. 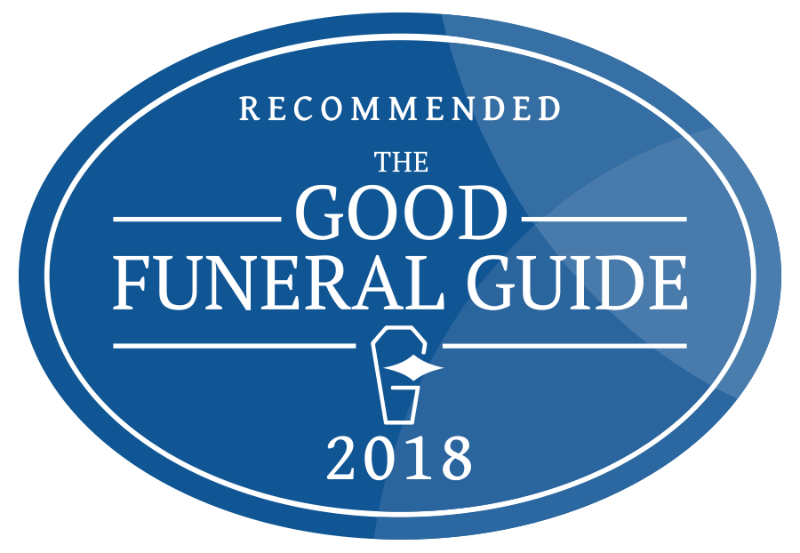 We chose Daniel Ross funerals based on reviews and can honestly say the family ‘echo’ all that has been previously written. Daniel and Sarah provided an exceptional service, empathy at all times and wonderful care of my lovely Dad. Dad had been a serving RAF sergeant in WW2, had such belief in the Catholic faith and a man of family and integrity that his funeral must reflect all of this. Without exception Daniel Ross funerals provided a funeral for Dad that was dignified, respectful and honourable in church and at the crematorium. It was comforting and reassuring to know that my Dad was in their care at the premises; we were able to visit him twice before the funeral.